Vehicles run on complex engines, which help regulate the speed and safety of the vehicle. These engines consist of automotive components, including radiators. Automotive radiators are an essential part of the vehicle engine system, as it helps maintain the temperature of the engine. Increasing demand for fast-moving vehicles is increasing the demand for light-weight and highly effective radiators, to help cool the engine. Radiators are made up of different materials, depending on its application. Metal radiators have been replaced by aluminum/plastic radiators by large. Metal radiators, are heavy and costly, thus the demand for materials such as aluminum and plastic is increasing, as they are relatively light in weight and more cost-effective. Automotive radiators market growth is expected to be driven by increasing adoption of hybrid powertrains. Furthermore, government of various economies are imposing stringent regulations regarding reduction of carbon emissions from vehicles, which is projected to fuel growth of the automotive radiators market during the forecast period (2017 - 2025). The regulations such as Low Emission Vehicle (LEV) III, Tier 3, and Super Ultra Low Emissions Vehicle (SULEV) are implied to ensure least carbon emissions. Increasing inclination of consumers towards hybrid vehicles, owing to its enhanced power and fuel-efficiency is propelling demand for automotive radiators. Furthermore, hybrid vehicles require additional low temperature heat exchangers for regulated battery cooling along with normal heat exchangers. Therefore, increasing demand for additional low-temperature heat exchangers is projected to drive growth of the automotive radiators market. Radiators helps protect the engines from overheating, which otherwise can damage the overall engine. They are heat exchangers that are used for cooling internal combustion engines. Major application areas of radiators include automobiles, piston-engines aircraft, motorcycles, railway locomotive, and stationary generating plants among others. The internal combustion engines in an automobile or piston-engine aircraft are cooled by the liquid coolant circulation through the engine block. The heat generated by the engine is thus dissipated by radiators. The coolant used is commonly water-based, however, can be in the form of oil as well. Usually, water pump is employed to circulate the engine coolant and dissipate engine heat. Growing aircraft sector, is in turn, increasing the demand for radiators. Piston-engine aircraft have liquid-cooled inline engines, which require radiators to dissipate heat generated by the engine. Due to more fuel combustion than cars, the engine is cooled more efficiently without the use of large cooling fans. Growing demand for automobiles in emerging economies of Asia Pacific and Central & South America, is expected to favor growth of the automotive radiator market over the forecast period. North America and Europe are expected to witness moderate demand for automotive radiators, owing to sluggish economic growth and market saturation. Stringent regulatory norms pertaining to environmental considerations, particularly in the developed economies, are expected to positively impact growth of the market. Some of the key players operating in the global automotive radiator market include Denso Corporation, Valeo SA, Calsonic Kansei Corporation, Mahle GmbH, Sanden Holdings Corporation, TYC Brother Industrial Co. Ltd., Modine Manufacturing Company, Sciton Inc., Keihin Corporation, PWR Advanced Cooling Technology, Griffin Thermal Products, and Saldana Racing Products. The study includes in-depth overview of the global automotive radiator market. The automotive radiator market was valued at US$ 5,284.76 million in 2016 and is projected to reach US$ 8,702.71 million by 2025, exhibiting a CAGR of 5.15% over the forecast period. 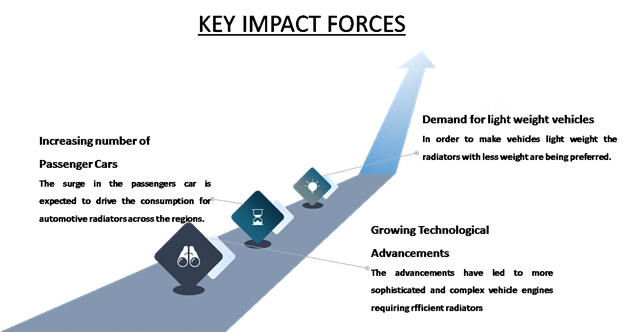 Growth of the automotive radiators market is driven by increasing adoption of hybrid powertrains on account of its lower emissions and hybrid technology, which allows minimal fuel consumption as compared to internal combustion engines with the help of fully electric mechanism, growing agricultural sector, which is increasing the demand for heavy commercial vehicles. Radiators play an important role in maintaining the stable temperature of an engine. Increasing number of research and development initiatives by manufacturers are leading to the development of light-weight and efficient radiators, in turn, boosting growth of the market. Also, stringent government regulations regarding reduced emissions is boosting demand for automotive radiators. Advanced radiators such as those which consume ground level ozone and convert it into oxygen are being adopted, owing to increasing demand for light weight engine components, in turn, propelling the demand for aluminum radiators. 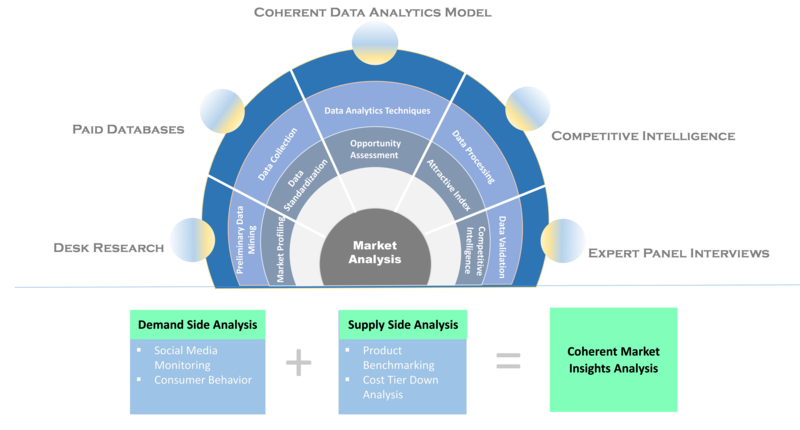 *Browse 60 market data tables and 40 figures on "Automotive Radiator Market - Global forecast to 2025”.